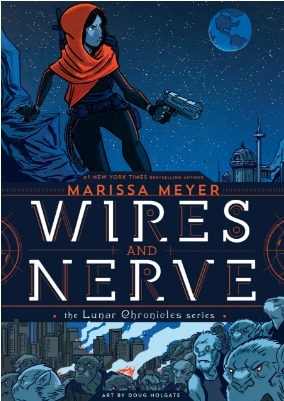 Summary (Goodreads): In her first graphic novel, bestselling author Marissa Meyer extends the world of the Lunar Chronicles with a brand-new, action-packed story about Iko, the android with a heart of (mechanized) gold. When rogue packs of wolf-hybrid soldiers threaten the tenuous peace alliance between Earth and Luna, Iko takes it upon herself to hunt down the soldiers’ leader. She is soon working with a handsome royal guard who forces her to question everything she knows about love, loyalty, and her own humanity. With appearances by Cinder and the rest of the Rampion crew, this is a must-have for fans of the bestselling series. It’s a well-known fact that I love Marissa Meyer and her books. However, if I’m being honest, this one didn’t feel like a book (and yes, I know that it’s a graphic novel). Wires and Nerve is set up to be an action story, with lots of cameos from other characters and lots more adventure. 240 pages isn’t a lot of room to get in a full story, especially when it’s pictures, but this felt like a prequel or a part one, which should have had a part two after it with the actual meat of the story. This felt like filler. Well-crafted filler. Yes, the catch-up with the characters and the villains is necessary, but the summary of the novel (read above) promises a lot more than what is actually in the book. This is the assembly of the crew before the ship takes off and the real adventure begins. I’m hoping the second book will be a bit more, in all aspects. I’m giving this the rating of 3 ★s because while it felt incomplete, it was still put together well. The characters are still the same, lovable ones from the original series (even though seeing the art of them messes up the picture of them I’ve created in my head), but we get to see a bit more of them in a setting that doesn’t involve near-death experiences every hour. In Winter (the last book in the original series), Cinder talks about dissolving the Lunar monarchy, and she carries out that plan in this new series. I’m excited to see how the plot lines from the first series will continue into Iko’s adventures (and hopefully the romance will develop like it did in the other books–don’t even get me started on Kinney). I was hoping the next book would come out later this year, but of course, it’s January 2018. So long to wait for a short and slightly unsatisfying book, I know. But I’d do anything to read more about the Rampion crew (I love them and I’m not embarrassed about that). Have you read Wires and Nerve/The Lunar Chronicles?